Tapestries and Stumpwork covers tapestries, lace and needlework. Pieces in our auctions will range in date from Medieval times right up to the end of the 20th century. Tapestries were first produced in Switzerland and Germany in the 14th century. Production soon spread though Belgium, France and the Low Countries. They were used mostly to adorn the walls of churches and castles. Tapestries not only acted as visual displays, they also proved good for insulation against the cold during the winter months. Tapestries were valuable items and were always included in household inventories. 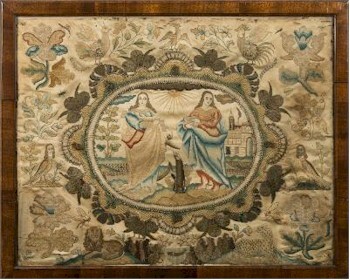 A 17th Century Stumpwork Picture (FS27/512). Subjects depicted in the tapestries were mostly derived from mythology or the Bible. During the 17th and 18th centuries, Flemish tapestries dominated the market, with Aubusson in France and Brussels in Belgium also producing fine works. Today, most machine-woven tapestries are produced in Brussels. Lace is an open work fabric produced by twisting, knotting, looping or braiding threads together. Used to adorn table linen and clothes, lace became popular from the 16th century onwards. Designs and techniques differed from country to country and examples of Maltese, Spanish, Honiton, Chantilly and Brussels lace are often included in our Fine Sales. Stumpwork is a style of embroidery where the stitched figures are raised from the background linen to produce a three-dimensional picture. Closely related to tapestries, stumpwork was popular during the 17th century with boxes and mirrors having stumpwork panels applied to them. Subject matters included scenes from the Bible, or were royalty related.